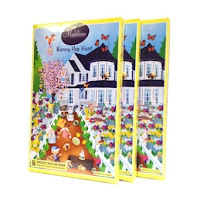 Easter is right around the corner, and we all know that chocolate Easter bunnies are always a favorite among children. My children always look forward to getting a chocolate or white chocolate Easter bunny in their Easter basket. The Madelaine Chocolate Company carries a wide assortment of chocolates for just about every season, holiday, sport or occasion. Chocolate bunnies, eggs and ducks for Easter, assorted roses and tulips for Mother's Day, chocolate cigars for the newest addition, and the list goes on. I received the following items for review and one lucky reader will win the same items just in time for Easter! 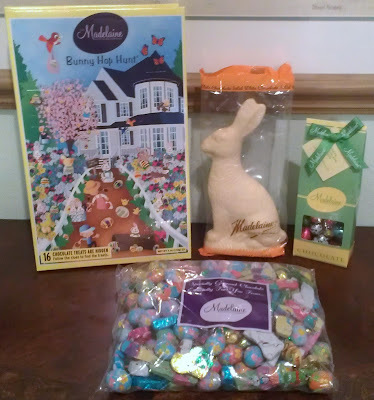 Two Pound Easter Chocolate Assortment: This 2 lb assortment can be used in Easter Hunts, baskets, or simply sprinkled on any Easter table for decoration and enjoyment. 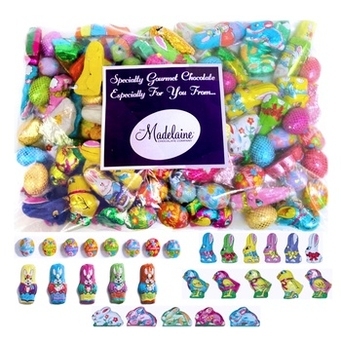 Made up of different brightly colored Easter eggs as well as fun shapes and Assortment includes: Solid Milk Chocolate eggs Crispy Milk chocolate eggs Mini Bunnies Baby Bunnies Baby Chicks. 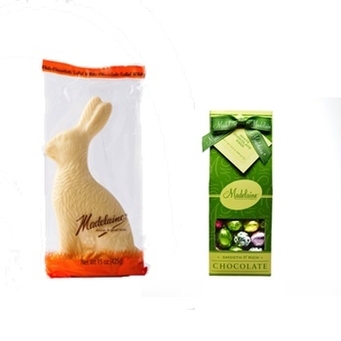 White Chocolate Easter Bunny Gift Set: This is the ultimate gift for a white chocolate lover! We have paired our impressive 15 oz sitting rabbit with our elegant 6.5 oz gift bag both using our smooth and creamy white chocolate. Easter just wouldn't be the same without all the delicious chocolate. My kids love opening their plastic Easter eggs to find their special chocolate treats hiding inside! Bunny Hop Hunt (Set of 3): Our Bunny Hop Hunt is an interactive chocolate game that everyone in the family can enjoy. Each Hunt comes with 16 pieces of assorted Easter chocolates. Behind each window is a yummy treat and a clue to find the next chocolate. Chocolates include: Crispy milk chocolate eggs, caramel filled milk chocolate eggs, milk truffle eggs, and solid milk chocolate funny bunnies. I've had the pleasure of trying a variety of chocolates from The Madelaine Chocolate Company, and the experience has always been the same - pure delight! Their chocolates are not only fun and festive, they are also smooth, creamy and delicious! Located in Far Rockaway, Queens, we're proud to say that as an American family-owned and run company, our chocolates have been made solely in New York and have been part of the American family life for 60 years. 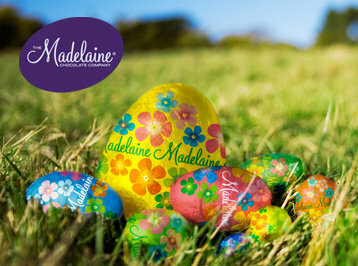 From holidays and birthdays, to Easter, Valentines and graduations - The Madelaine Chocolate Company has always been there. Using the finest quality chocolate, innovative shapes and unique Italian foils, we’re proud to help make every moment special. I like the chocolate filled cigars. They are a great alternative to the real thing for birth announcements. Though to be fair, asking a person to choose a favorite chocolate is akin to asking them to pick their favorite child. I like the chocolate mini eggs in the purple wrapper. LOL, You have a point! Ha Ha Ha! Mmmmmm, the peanut butter filled milk chocolate is by far the best! The white Truffle & Raspberry duet looks good. I also like the chocolate filled cigars. The birth announcement idea is a good one. I also like the Hatchers Peanut Butter Filled Milk Chocolate Eggs Gift Basket. I like the Hatchers Peanut Butter filled chocolate eggs too. They sound wonderful. I like the "Bite sized crispy premium milk chocolate balls." I love anything with crispies or nuts in 'em. YUMMY! I want the White Chocolate Bunny! I like the mini chicks. Small pieces to share with everyone. The Caramel Filled Milk Chocolate Eggs look good. I'd like to try the chocolate mint truffles. Thanks for the chance. My favorites are the Caramel Filled Milk Chocolate Eggs & the Peanut Butter Filled Milk Chocolate Eggs.